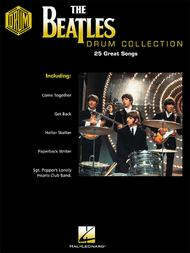 The Beatles Drum Collection by The Beatles. For Drums. Drum Recorded Versions. Classic Rock, Britpop and Psychedelic Rock. Difficulty: medium. Drum/vocal songbook. Drum notation, vocal melody, lyrics, chord names and drum notation legend. 128 pages. Published by Hal Leonard (HL.690402).ISBN 0634014145. With drum notation, vocal melody, lyrics, chord names and drum notation legend. Classic Rock, Britpop and Psychedelic Rock. 9x12 inches.This transcription book lets drummers examine Ringo's note-for-note tracks to 25 classics by The Beatles: Back in the U.S.S.R., Birthday, Can't Buy Me Love, Come Together, Eight Days a Week, Get Back, Help!, Helter Skelter, I Saw Her Standing There, Ob-La-Di, Ob-La-Da, Paperback Writer, Revolution, Sgt. Pepper's Lonely Hearts Club Band, Something, Twist and Shout, more!